ALL ACCESS: City Life - CoH & CoV General Discussions This forum is for City of Heroes and City of Villains game-related discussions ONLY. Off-topic threads will be removed. Cannot Ustream in HD mode from SDCC, alas. SDCC's dedication connection for NCSoft cannot handle flavor of this magnitude. We're introduced to Katie, one of the NC Soft Booth Managers. The usual Atlas Park music is gone, replaced with new Atlas music. Hint hint, I think. 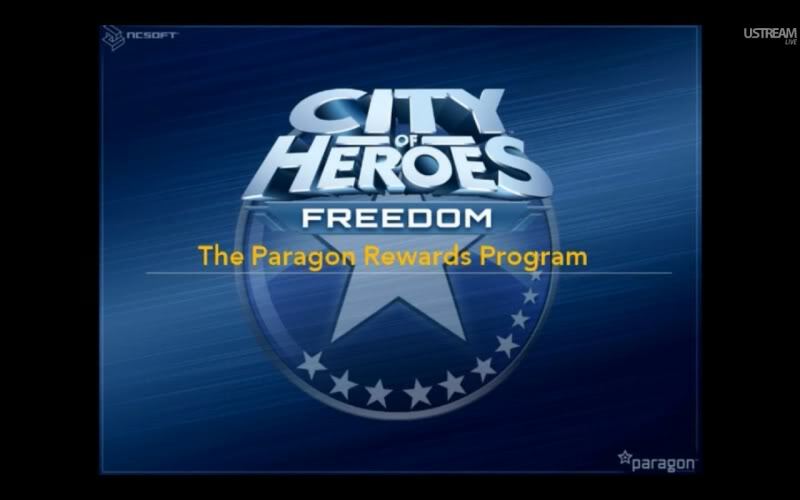 Black Pebble is going to be talking to us about the Paragon Rewards Program. Forklifts and construction noises abound! We're shown the CoH part of the booth. The flatscreens have what looks like the costume creator. Black Pebble is wearing a new CoH show shirt. Recapping of other events taking place from Paragon at SDCC. Second Measure has just barely escaped shirt shorting duty and requests this take as long as possible. Stream freezes because Zwill didn't show the luchadore. Black Pebble has likely murdered everyone at SDCC because Zwill showed him on air. Maybe the luchadore was just a distraction, and a troop of minis came out of a forklift and attacked? Voice over PA regarding power outage. A tech guy, Jason, who is obviously The One, states that something knocked power out on the entire West side of the building. He likely had to fight Agent Smith in order to restore said power. They have to restart AGAIN! Zwill cannot convince Karen, the other booth manager, to appear on camera. Zwill blames it on Ninjas. In order to defeat the ninjas, the luchadore destroyed half the building. Tangent: background makes them feel like they're on one of those Hollywood shows. Tangent: People are ALREADY lining up for panels. Don't ask a Vahzilok "Who are you wearing?" We're being offered something completely new, and insured Zwill's clothing will stay on. Zwill banishes Second Measure to shirt sorting duty. Three werewolf moon shirts! Being given away at booth and meet and greet. We're getting a version of the presentation they gave the focus group. BP'S new shirt: based on the Freedom Stateman vs. Giant Robot graphic. Black Pebble is a humorless, soulless marketing robot, that does not tell stories. Tangent: McDonalds food: Nuremburger: two sausages on a bun. Tangent: The PA system, again. 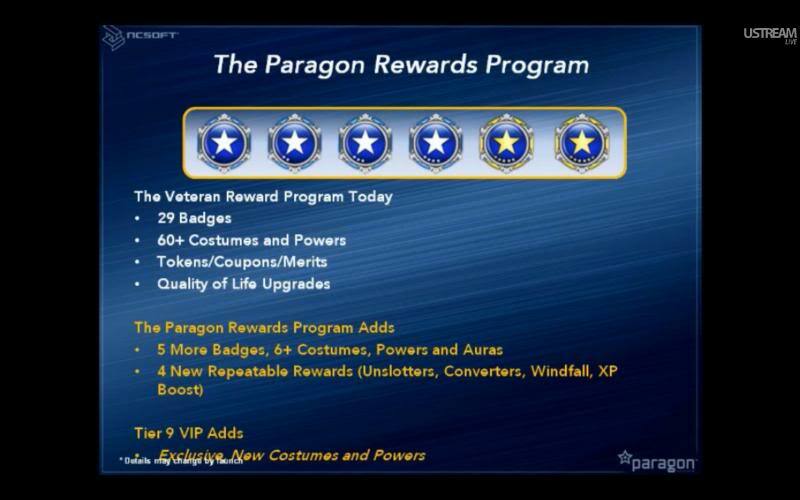 Vet rewards are unintuitive to claim with using the badge system, so they wanted to improve on the system. Is not QUITE an in-game currency. IO booster is like combining two SO's into one, but for IO's. Increases the stats slightly. Tangent: Noisy Guild Wars guys. Zwill challenges them to a dance fight. 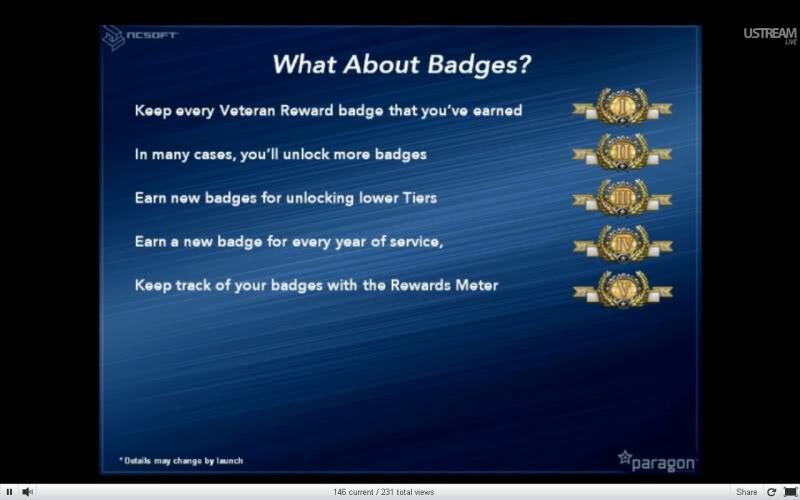 Existing Vet reward badges will still be earned by unlocking different rewards and tiers. There is a new badge for every year of subscription, one for completing the tutorial. They are not SELLING them. Technically. 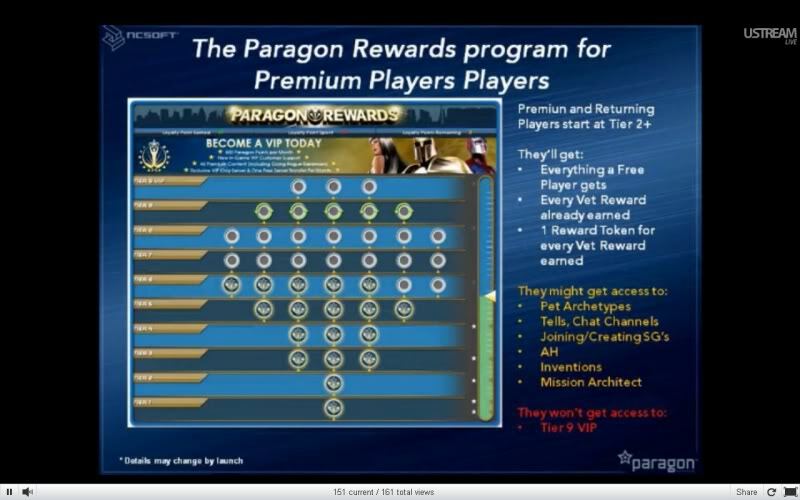 It's a free to buy badge that teaches how to use the Paragon Market. Chat: Posi believes you can go past the current IO max level. The thermometer thing on the side tracks the amount of reward tokens you earned. It's not a tree. It's a Paragon Points Bush. Not a Shrubbery. 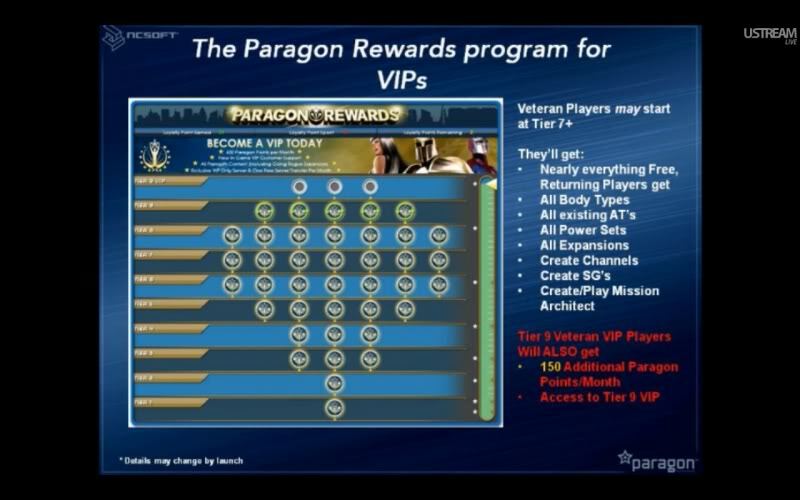 Most Tier benefits are if you're a VIP player, not a Premium. But some will be there for Premium. 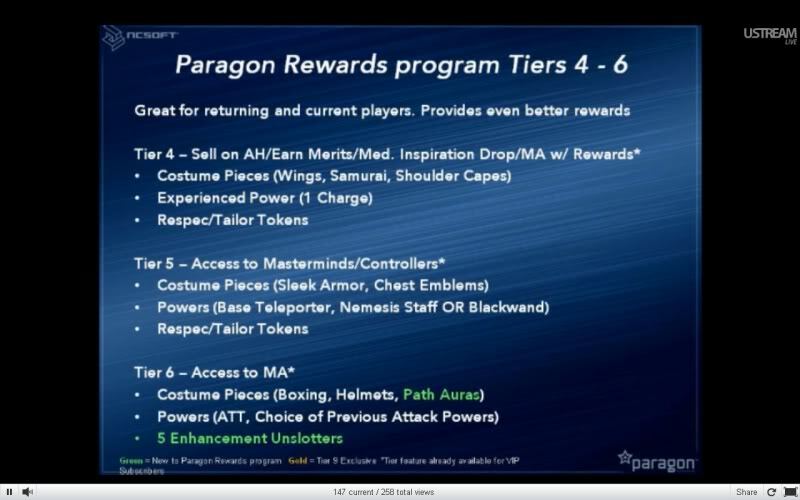 Tier 1's 50 paragon points are apparently used in the tutorial. There is an error on that slide, and they're muting to discuss it. They'll talk about Tier 1-3 later. Going Rogue enhancements are for each new character. IF you have all the rewards, you can use your tokens to get consumables every month. Zwill: "So you're saying that I can have Statesline... er... Statemen..."
If you are a Tier 9 VIP player a bonus 150 points per month. Total of 550 points for free. They don't flap, they swim. Armor comes with new weapon customization options. They have angered the Ustream gods. We've lost video, but still have audio. Zwill restarts, condemning those of us without Adblock to Fabio. IO booster is permanent effect. Tangent: World's Largest Tape in background. Chat is seemingly over, Posi will continue to answer questions in chat. They're having technical difficulties. OR possibly technico difficulties due to Luchador attack. Yes, you can indeed get to tier 9 by buying a huge load of points. 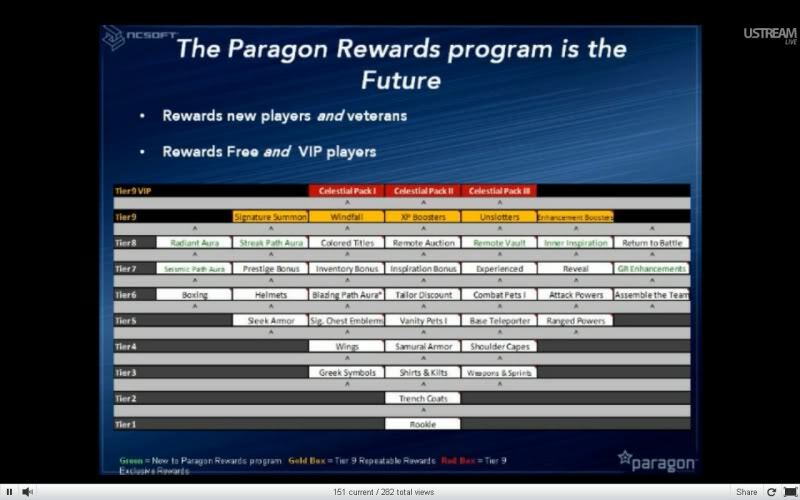 1:47 Zortel-1: Positron, it mentioned you get 1 Reward Token for every 1,200 points purchased. Does that take into account the Bonus Points for larger purchases mentioned? IO unslotter merely removes the IO, it does not allow you to move the slot to another power. You can buy the 1200 points in smaller increments, you don't have to get them all at once. Chat tangent: Confusion between Beastyle and Positron over the status of the chat. The cost for the points is $15 per token. A player can essentially "buy up" the months they missed in order to get to higher tiers. The video portion of chat is officially over. The dev chat team have been summoned to the Alienware park to help set up. There will be further video chats on Friday and Saturday. Premium players unlock being able to play AE arcs and being able to make AE arcs separately. Until I see something that states to the contrary, going to assume VK is right . Hellfire Elementalist EAT, Provides 300% USDA Daily Allowance of Confusing Numbers! Last edited by Von Krieger; 07-20-2011 at 01:11 PM. *******. God bless you for your transcription work. There are no words for what this community, and the friends I have made here mean to me. 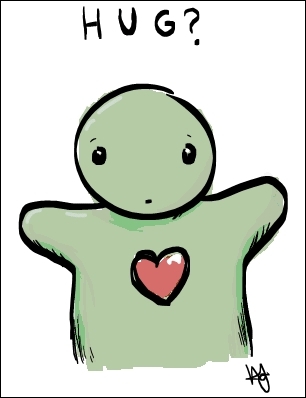 Please know that I care for all of you, yes, even you. If you Twitter, I'm MrThan. If you're Unleashed, I'm dumps. I'll try and get registered on the Titan Forums as well. Peace, and thanks for the best nine years anyone could ever ask for. Count on the tier thingy. You get Number of Vet Badges + (Number of Vet Badges/4) tokens. 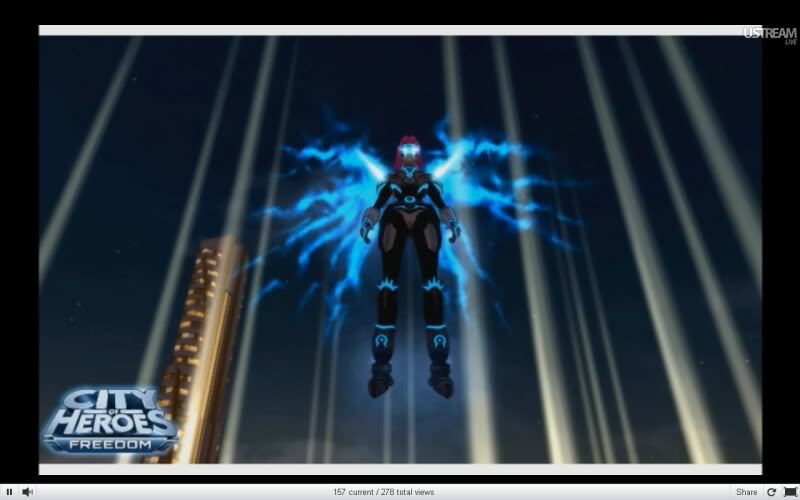 The stills really don't do justice for the coolness of the flowing energy wings. Just...wow. I love...um...the part where... Yeah. Okay, maybe I'm missing something horrible here, but I'm okay with all of this. 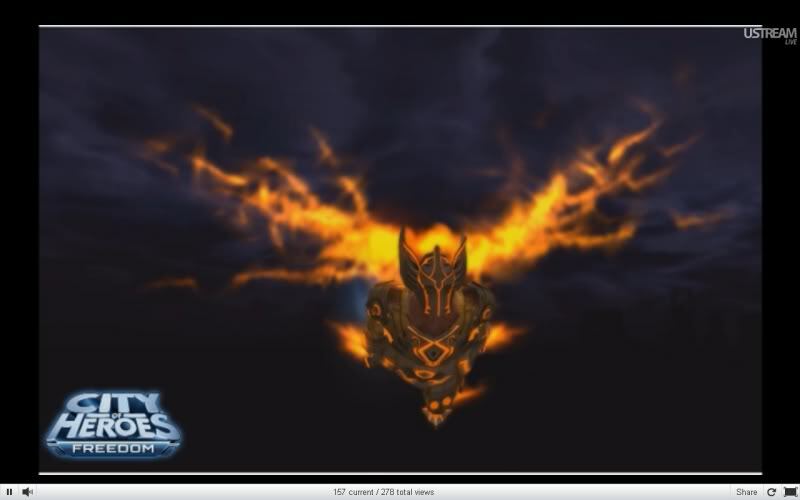 And hey look, the Dual Inspirations from 2009 are here, too. Were they always a part of this? Has this been in progress since then? ... okay. I really... really... really... really did not expect an unslotting reward. What would a 2 year vet have? My head is wonky in calculating that stuff. 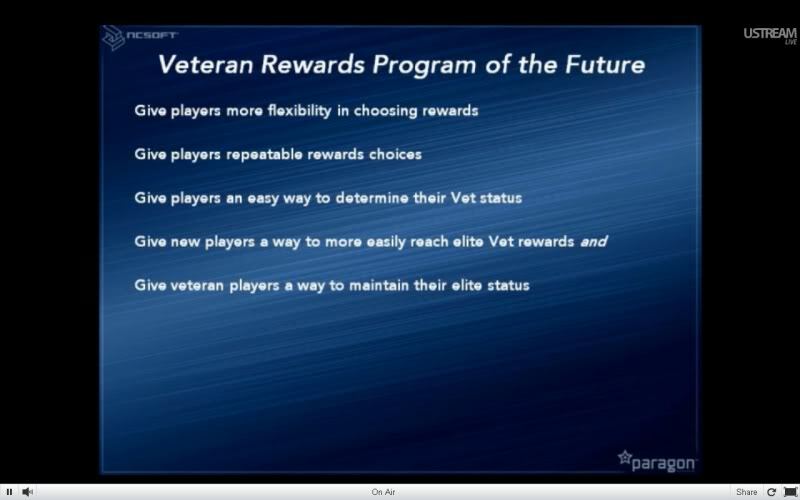 So is this just a run-down of how Vet rewards will work in Freedom, or is this a preview of how the whole market will work? 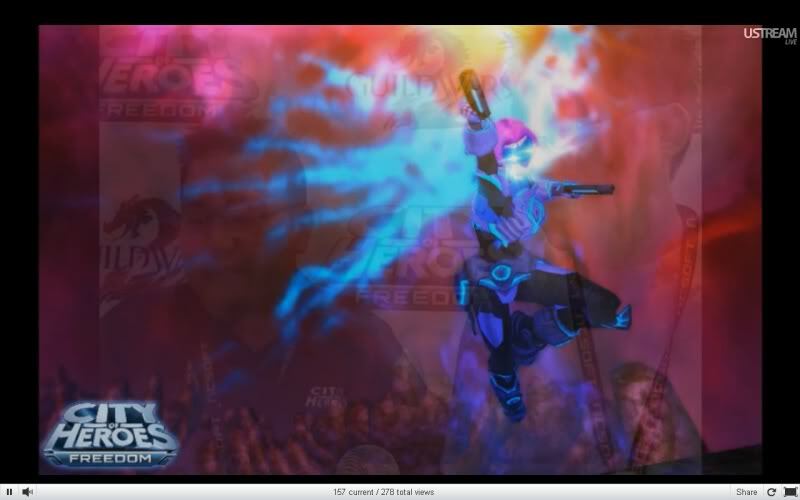 "To die hating NCSoft for shutting down City of Heroes, that was Freedom." This is just the vet rewards. 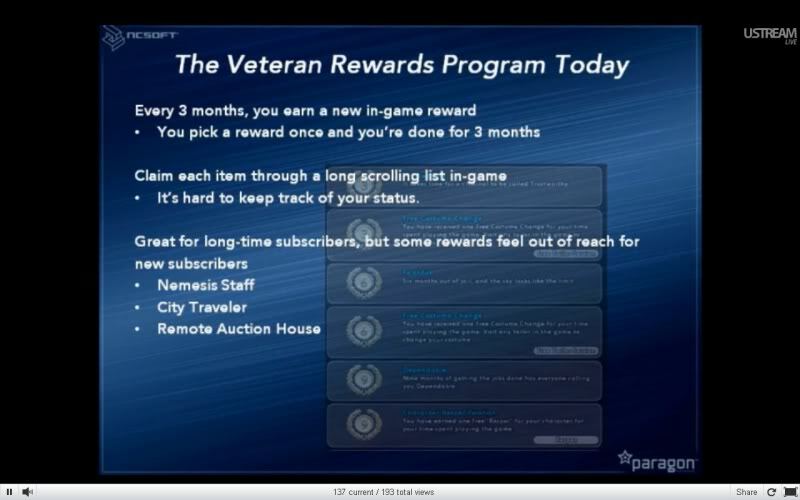 However, one component of the vet rewards is extra cash to spend in the market. Location: Maine... the state... NO it's not a Canadian Suburb. Also... The IO Booster power will (if I got this right) increase the effectiveness of any IO Enhancement it is attached to by x5. So, if you hook it up to an IO Damage it will increase the bonus of that IO by a factor of five. Black Pebble said that if the Booster was attached to a specific function IO such as the Luck of the Gambler speed increase, it would treat it as though the character had two such enhancements slotted instead of just one. Also, Positron confirmed that these boosters are PERMANENT. They are NOT like inspirations to just give you a short-term increase. He was unable to confirm if there is a maximum number of boosters you can use or how many such a number would be. 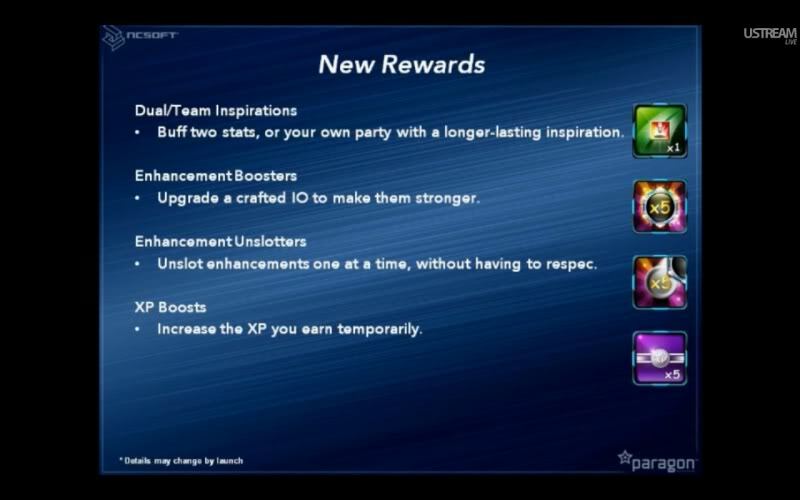 Oh, another new nifty item that will be available through your Paragon Rewards will be new Inspirations. There will be two new types. The other will be a Team Inspiration which apparently work like normal inspirations but the bonus applies to the entire team and not just the person popping it. Also, thanks for the transcription. My Dark/MA and new Dark/Fire Tank builds. Check out all my guides and fiction pieces on my blog. don'T attempt to read tHis mEssaGe, And believe Me, it is not a codE. I'm not sure about that, I think the x5 means you will get 5 of them. 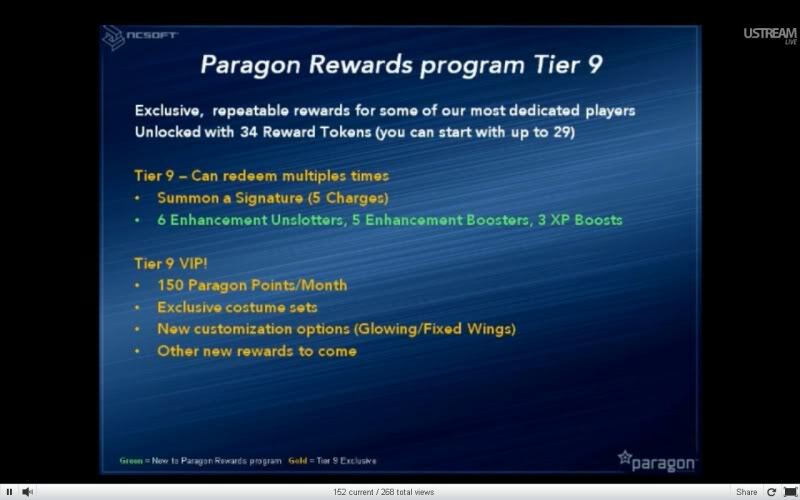 And from what they said, I understood it to mean that the booster will increase the level of the enhancement by 1 (like when we combine two regular enhancements). EDIT: though it does seem unclear and I could very well be mistaken. Always remember, we were Heroes. 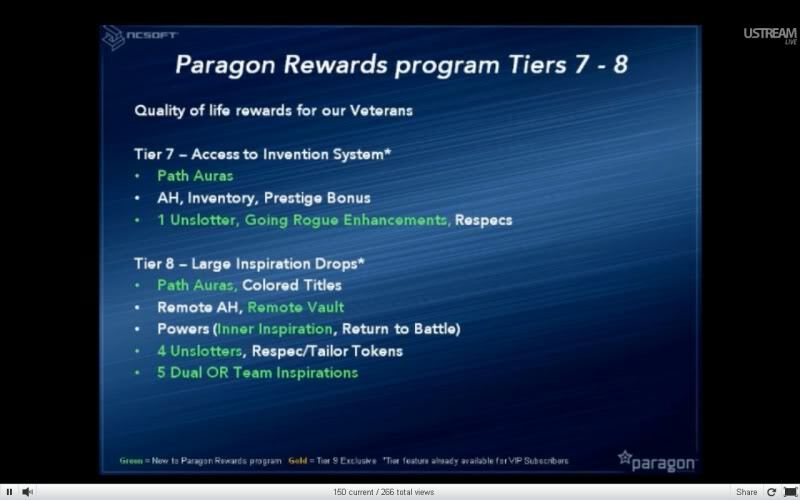 Looks like just Vet Rewards. And it looks like an interesting update to the system. Looking at the chart that will put you past Tier 4 and well into Tier 5. Looking at the screenshots and comparing things, it means you get 5 of them. Last edited by Von Krieger; 07-20-2011 at 12:58 PM. Looking at the chart that will put you past Tier 4 with no tokens in Tier 5. Thanks and arggggghhh, so close to the Nemesis Staff!